If you are looking for an all day paddle, this is the paddle for you! For the rest of you, there are alternate take-out/put-in's to shorten the trip. The first time I paddled this reach I was in High School and our day paddle included portaging the Vernon dam. It rained all day and the three of us got soaking wet. My Dad came and picked up us Wet Rats in Turners Falls and brought us home. I'm sure your paddle will be much more fun. 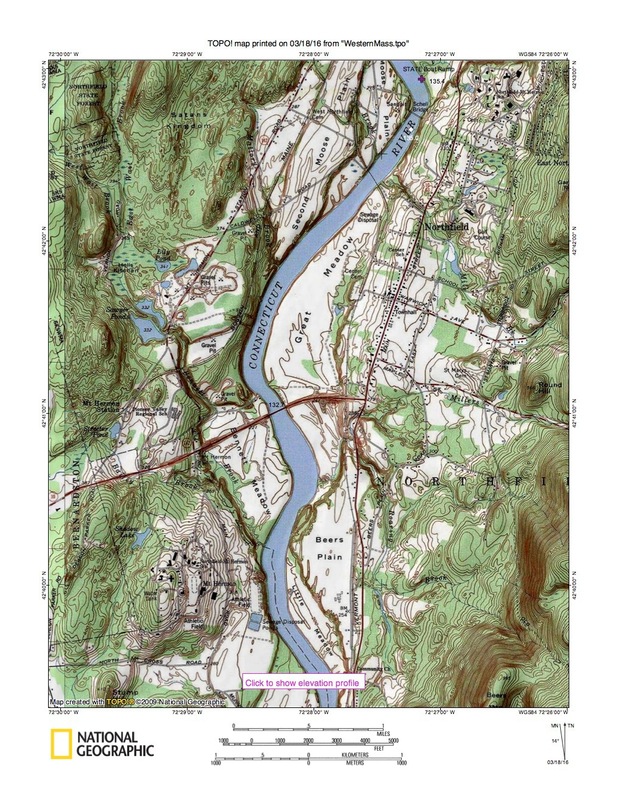 Many People have told me this is their favorite reach on the Connecticut River. I am not sure how much of the river they had actually paddle but certainly this is one of the most beautiful ones. Take Out above dam on river right (west) side above the barrier. Follow the ramp way up to Governor Hunt Road. 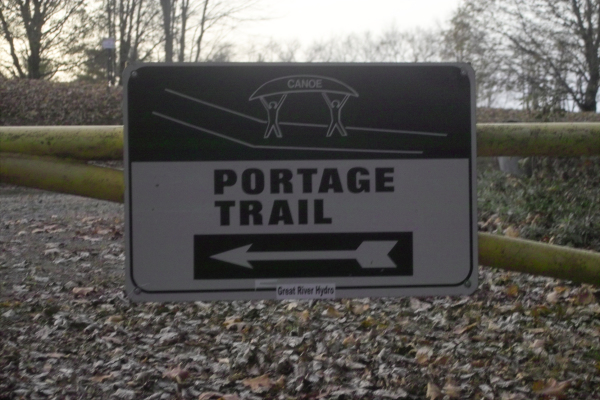 Follow the portage signs along the river. Put in on beach below the dam across from the Tavern. After getting off the highway, head north on Route 10. At mile 2.5, turn left onto Route 142 North. At mile 6.5 you enter the state of Vermont. At mile 10.8, turn right onto Governor Hunt Road. The dam will come into view quickly. At mile 10.9, turn right onto a sandy road that goes to a beach. If you have an ordinary car, you may want to park on the road and carry the short distance in to the water. Follow the portage signs along Governor Hunt Road. The river drops 36 feet. There is a boat launching area, a beach, and a tavern across from the picnic area. Car Top Launch near power plant discharge. Located in the middle of the river directly under the crossing power lines. It is sometimes underwater based on water level. The three towns Erving, Gill and Northfield meet at the rock. Named after the rock, the French King Bridge, aka FKB, was opened to traffic on 10 September 1932. The bridge was awarded the "Most Beautiful Steel Bridge" in 1932 by the American Institute of Steel Construction. It was rebuilt in 1992, and refurbished again between 2008 and 2010. There is a parking area at both ends of the bridge. Walk the side walk and get treated to a beautiful view looking north. The Millers River enters just below the bridge on the left (east) side of the river. When the rivers are high from rain this area can be turbulant. The river now turns north briefly then due west through what is called the Horse Race before and then west southwest with a penninsula on your right. Pass through the Narrows into Bartons Cove there is a small beach on your right. This is the take-out for this paddle. If you are continuing on, you can request a portage ride around the dam area. For the Barton Cove shuttle service, groups with more than four boats are asked to call one month in advance to plan ahead for portage dates. On most days, portages will be provided within 15 to 90 minutes of the boater's telephone call. Paddlers should have all gear unloaded and wait by their craft. Call 413-659-3761 to request a pick up. Paved State Boat Ramp. Parking for at least 20 vehicles. Tiolets available. 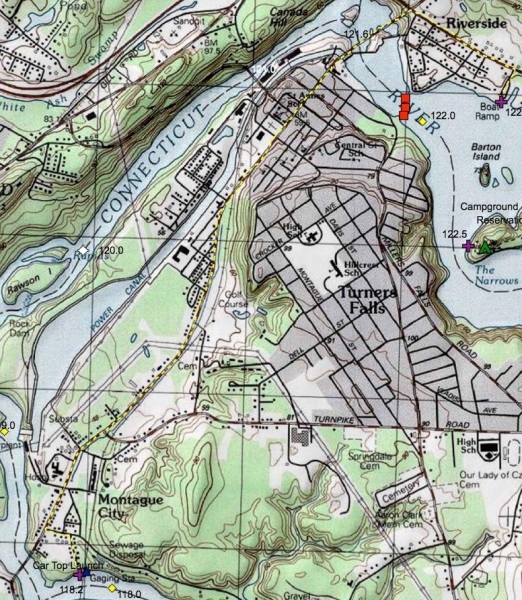 At mile 3.4, turn right onto Cove View. There is a green public boat ramp sign. The ramp and parking lot is visible from Rt 2. Portages around the dam are available seven days per week during daylight hours for canoes and kayaks. Due to the unpredictability of river travel times for boaters, portages are performed on an as needed basis for groups with four or fewer boats. Groups with more than four boats are asked to call one month in advance to plan ahead for portage dates. On most days, portages will be provided within 15 to 90 minutes of the boater’s telephone call. Paddlers should have all gear unloaded and wait by their craft. As you paddle into Barton Cove, look for the colorful rack of rental boats to help you find the Canoe and Kayak Rental area. Paddle to Barton Cove Canoe & Kayak Rental Area and unload gear from boats. Call 413-659-3761 to request a pick up. ​Barton Cove is open from Memorial Day through Labor Day. During closed hours or off-season paddlers need to use their own phones. Portages drop paddlers off at Poplar Street in Montague City. Pick Up and Drop Off Points can be found on the map below and the imbeded Google Earth below. 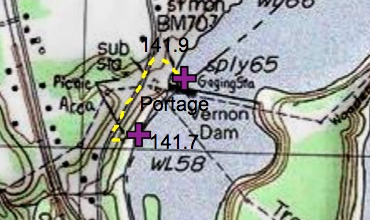 About a mile and a half down river of Stebbins Island is another island towards the right (west) shore. We could not find a name for this low lying island. If the river rises fast, flooding may occur making this a poor site for camping. Pass it on either side. Pass between five concrete remains of a bridge supports. It was once used for the railroad. Crossing the corner of 3 states! 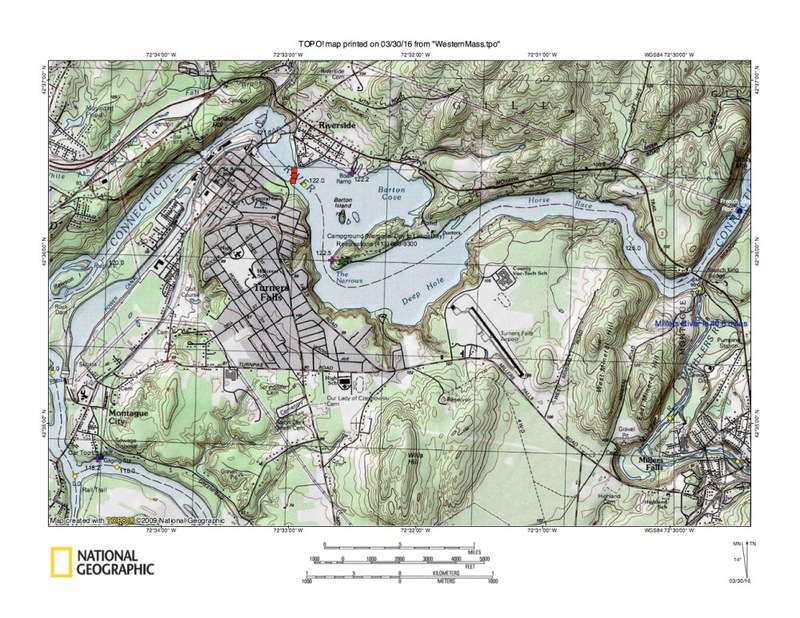 A six by six granite block with faces marked as "MASS", "VT", "NH" and elevation of 177 feet is submerged in the Connecticut River marking the survey location. It was above water until the Turner's Fall dam was raised in the 1960s. Apparently this monument was last seen in October 1969 when the dam was undergoing some maintenance work. The states have put up a monument on the Vermont shore where Massachusetts meets it as a replacement with inscription. Stop, climb the bluff, and read this historic piece of polished granite. This state boat ramp in Northfield offers water access for both car top paddlers and power boaters. It's located on the left (east) bank. Just down river you will pass under the Schell Bridge (135.1). See article below. Large paved parking lot with an excellent paved ramp. In 1903 Schell Memorial Bridge, a 515 foot long steel cantilever truss bridge, was donated to the town of Northfield by one of its leading citizens, Francis R. Schell, who hoped to obtain easy access from his chateau in downtown Northfield to the East Northfield Railroad Station. Schell Bridge is the third oldest of five Pennsylvania Truss Bridges and was designed by Edward S. Shaw, an important bridge engineer in Massachusetts from 1873 to 1919. 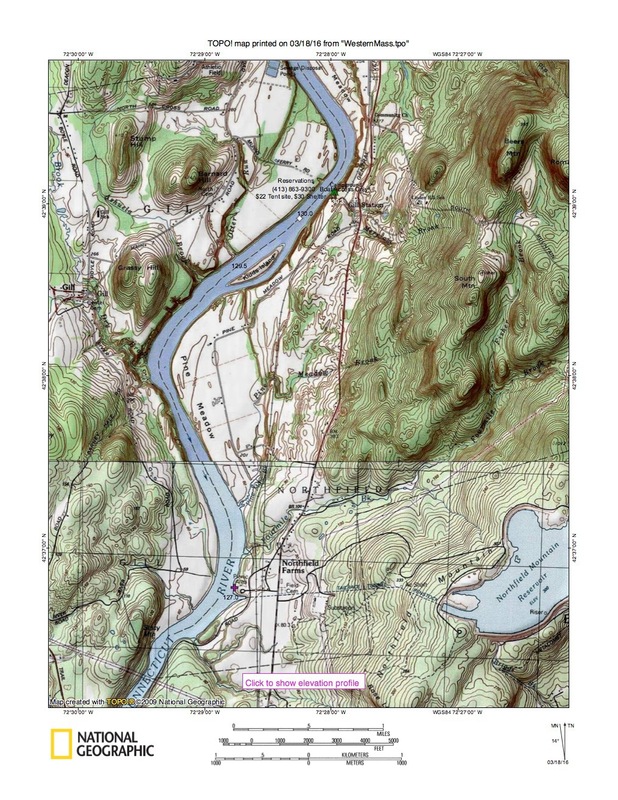 Up until its closing, in 1985 Schell Bridge provided the town with easy transportation between the two sides of the village, which is divided by the Connecticut River.In 1985 Schell Bridge was closed because it had deteriorated too far for safe use. Due to lack of funding, the bridge had not been adequately maintained. 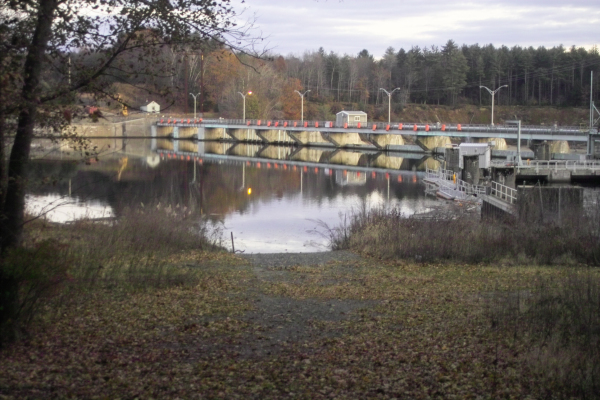 MassDOT devised a plan to rehabilitate the bridge, but the town could not justify the costs of assuming responsibility for maintaining the rehabilitated structure. In 1987, with no group willing to take on the responsibility of the bridge, the decision was made to tear it down. Demolition bids were made and contracts awarded in 1999, but the bridge has thus far not been torn down. Before the bridge was constructed, a ferry known as "Bissel's Ferry" operated approximately a quarter-mile upriver from this site. 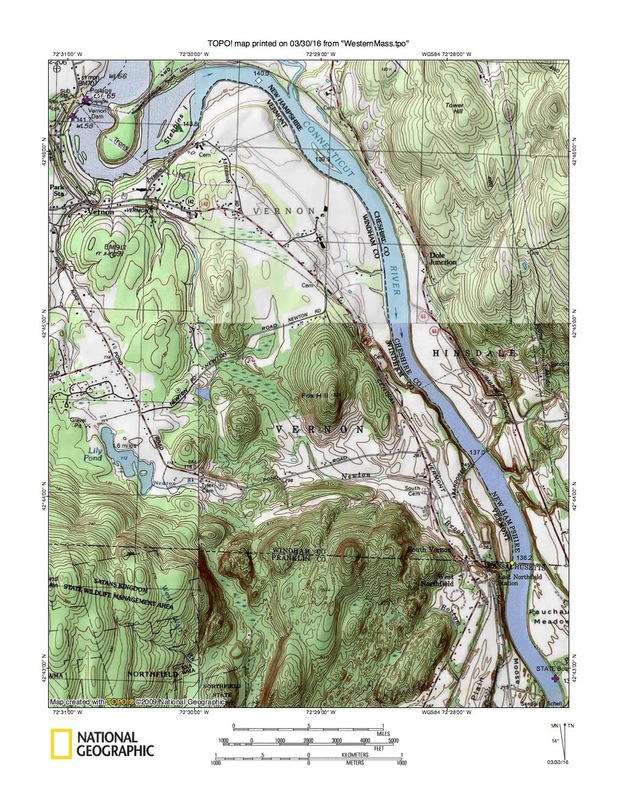 In 1878, the ferry was replaced by an earlier bridge, known as the Upper or 'Red' Suspension Bridge -- distinguishing it from the "Lower Suspension Bridge," at the current downriver site of the Turners Falls Road Bridge -- which was 563 feet long. Damaged beyond repair in the devastating Connecticut Valley flood of 1936, it was replaced by the current bridge in 1938 and torn down in 1942 to recover materials for the war effort; its piers remain on the river banks. The current structure began construction on May 17, 1937 and was completed in September 1938. The bridge was dedicated on Saturday, September 10, 1938. By 2010, the road deck of the bridge had become riddled with potholes and uneven pavement. A major renovation project began in summer 2010 and finished in 2014 at an estimated cost of $40.7 million. King Philip's Hill, just upriver of the Route 10 bridge and on the right (west) bank, is a historic site off Old Bernardston Road in Northfield, MA. In 1675 the Wampanoag chief Metacom, also called "King Philip" by English colonists, is said to have held council here during King Philip's War. 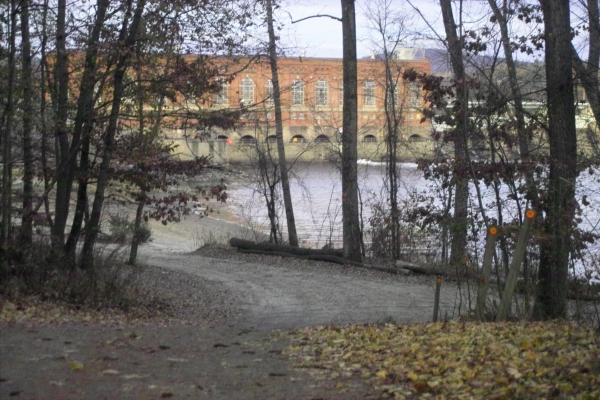 Located on the left (east) bank, Munns Ferry in Northfield is a small camping area for boaters and canoeists only owned and maintained by the power company. Tent sites are $22/night and the Adirondack shelter is $30/night. Reservations will be taken beginning the first Wednesday in April, call: 413-863-9300. Munns Ferry closes Columbus Day. 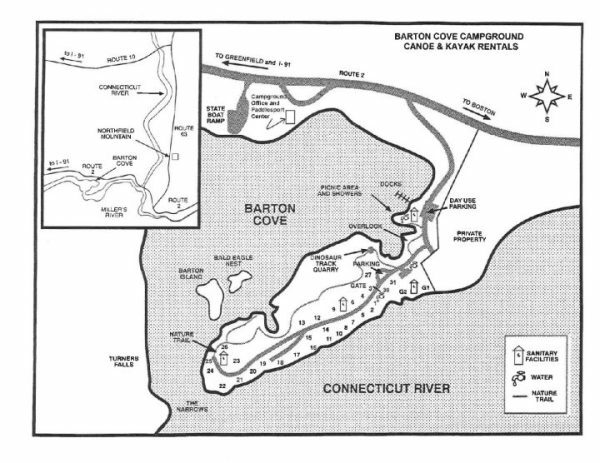 A small island in the Connecticut River, about 2130 feet in length. Legend has it that Captain Kidd, the infamous privateer, buried treasure on this island. If you find the treasure be sure to buy me a coffee and tell the tale.